Floor scrubbers can be a great benefit because they clean and dry the floors without any significant effort on the part of the operator. They can work on both small and large surface areas utilising high-speed motors scrubbing and sucking up unwanted waste and debris from a wide variety of floor types. Where it may take you five or more passes over an area with a mop and bucket or even hand scrubbing to remove a floor stain, a floor scrubber can remove a stubborn stain in one pass without contaminating the clean water with the dirty waste. Scrubbers can be used on a variety of surface areas including concrete, timber, tile, and stone. The suction portion of the scrubber vacuums the dirt, waste and dispenses it into the waste disposal tank. To get an even deeper scrub, a cleaning solution can be dispensed by the scrubber and then worked into the floor with agitation and then collected leaving a clean and dry floor behind. Retail stores. Scrubbers are ideal for retails stores or shops, both large and small. Retail stores in general tend to have areas of high foot traffic, which can lead to dirty floors, messes and spills, as well as accidents. Walk-behind floor scrubbers or multi compact scrubbers are ideal for cleaning up these spills and generally maintaining the floors on a regular basis. These machines are well suited for getting into smaller areas and aisles whereas ride-on machines can be used in retail stores with larger aisles and areas that need cleaning. Medical & healthcare facilities. Any facility or business related to medicine, health, and wellbeing needs to maintain the highest sanitary standards, and that includes keeping the floor spotless. For larger facilities, like hospitals, a ride-on scrubber is ideal because it can perform the cleaning job quickly and efficiently. Sometimes the cleaning needs to be done in a tight time frame when the foot traffic is low, therefore a larger ride on scrubber is essential in larger area cleaning. Schools & Offices. Most schools and offices have more than one type of flooring within them. A school might have a timber or rubber floor in the gymnasium, concrete in the shop, tile in the hallway, and vinyl in the music room. 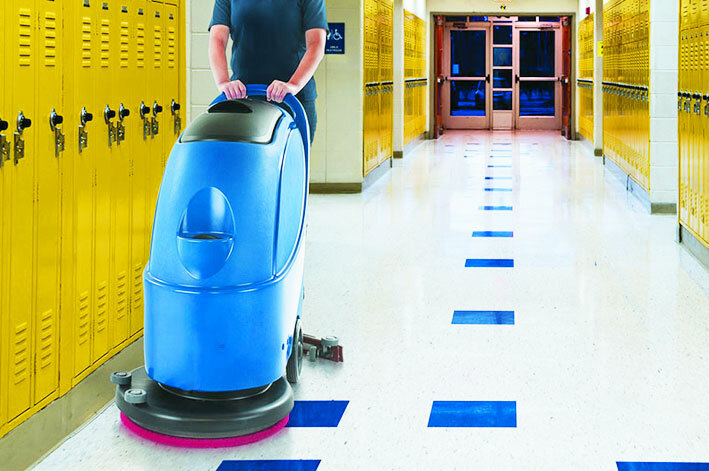 The right floor scrubber can tackle all of these surfaces during one cleaning session. Having one machine to do all of these cleaning jobs eliminate the need for many different cleaning machines. This can eliminate extra storage space not to mention the initial investment. Warehouses & Factories. Industrial spaces need to maintain their flooring either daily or weekly to protect their workers, maintain a safe work environment, and this will generally make for a far more productive work environment. These kinds of spaces require larger cleaning machines, generally larger walk behind or ride-on floor scrubbers. 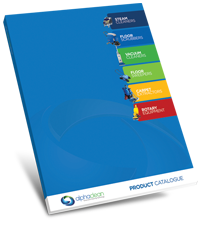 As you can see, floor scrubbers are useful for a variety of settings, businesses, and organizations. They can clean a combination of floor types including tile, concrete, vinyl and more. Whatever the need is generally a floor scrubber or floor sweeper will make the cleaning process far more effective.